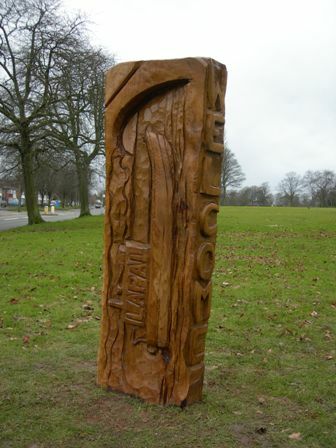 A new welcome post has been installed at the Harborne Lane / Gibbins Rd entrance to the park. Carved from solid wood the post depicts a canal boat approaching a bridge. This image was chosen because the park is bordered by the old Dudley No. 2 (Lapal) canal and the post is close to the site of Harborne Wharf (now occupied by the Scout Hut). The post, which was paid for in part by the Lapal Canal Trust, is part of our Nature and History trail. It is matched with a similar welcome post depicting a woodpecker which sits at the top of the Gibbins Rd frontage. Both posts feature an oak leaf motif on their reverse sides to represent Selly Oak. We expect the Nature / History trail to be completed in mid March. The trail itself is funded by Birmingham City Council and Grassroots. Nature items will include a story telling bench with bird carvings designed by children at St Mary's School, a signpost indicating natural features of the world, a willow sculpture, the Millennium wood, and signs relating to park wildlife and habitat. History items will include the park keepers lodge and the first park keeper, the donors of the park; Mrs Gibbins and her sons, Weoley Park Farm and the Lapal Canal. Off kilter, in case we trash to our class understudies they'll be pained and feel disfavor and they'll lose heart https://australian-writings.net well. In informative part every understudy or young woman should be given proportional importance by their advisers for ensure local.